Uri Geller & the Orange Spot. Reinventing yourself. It is magical!!! Every day is a new day... for sure. But every day, are you new? Coming from a magic convention hosted by Genii’s magazine, I feel that I have learned something new. Not only techniques but also experiences that as a human being help me to grow and realize that every day I can reinvent myself. When I was 18 years old, I was a student with 5 dollars in my pocket to buy a book about magic tricks. At that time in my country of Colombia, it was very difficult to find a book of magic tricks. I decided to go to “La Feria del Libro” – one of the largest international book fairs in Latin America and the world (at least that is what the advertising said). There were books everywhere and about everything you can imagine. But after walking around for four hours, I didn’t find a single book about magic tricks. I was sad and about to leave the book fair. Giving it one last chance, I walked to one of the kiosks where they had books about “everything” – except, I discovered, magic tricks. But before I could leave, a seller told me that the only magic book they had was about metaphysics… ha! And this guy who bends spoons. “Maybe it is something you want to do,” he said. Well that guy who bends spoons called my attention and I got the book, the orange spot. No tricks!!! But I got some information about the magic of self-esteem, and how powerful your mind can be, if you prepare it and tend to it the right way with a positive attitude. I want to say that this book with an “orange spot” and cassette impacted my life. With this book I emerged with a positive example of how to live my life. I started to practice most of the things that this book explained this book by Uri Geller. Reading Uri Geller's books inspired me. 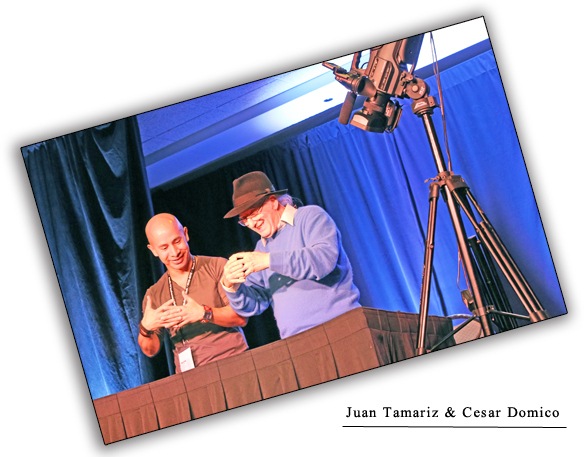 mentor and the master Magician – Juan Tamariz. For years I had been reading his books about his tremendous magic effects and techniques. Of course I was excited to see other magicians such as Eugene Burger, and more! I also heard that someone special would be there: Uri Geller. My mind immediately returned to that book from years ago. But mostly I was eager to see Juan Tamariz. The convention started with amazing magicians, lectures and expositions. 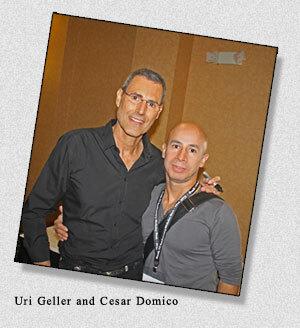 On the second morning of the convention, Friday, Oct. 5, they announced a presentation by Uri Geller. I was looking forward to it, remembering the impact his book had on me. But when he was on stage, Uri Geller didn’t perform a single trick – nor did he bend a spoon. Instead, he talked about his experiences. For me, it was the most incredible moment and highlight of the convention. Word for word, I felt connected to what he was saying and the same concepts I had tried to adopt for my life, especially in my most difficult moments. At one point, Uri Geller yelled at all of us magicians in that conference auditorium: “Re-invent yourselves! Get out of here and go work hard for yourself to be different. People are tired with the same card tricks, coins, illusions, magicians dressing the same, magicians appearing rabbits… do something different, be authentic!” In that moment I started to applaud….all by myself because no one else did. I loved what he said – the same concepts in his book. It was and has been the philosophy of my life. But I needed to be reminded of it and to hear those words again from someone – and what a surprise I was hearing those words from Uri Geller, yes the famous and amazing Uri Geller! picture and autograph. People with books, pictures, newspapers, etc. I needed to wait in line 25 minutes or more for his picture and autograph. For years I've known famous people in Colombia and here in the United States, and I never liked or felt the need to ask them for autographs or pictures. But with Uri Geller, I was so moved by his talk that I wanted not only a picture and autograph but also to express to him how much of a positive impact his book and his words made on my life. When I told him, he shook my hand and hugged me. Despite all the people trying to get his attention, he took the time to listen to me. I truly believe that books or situations don’t change people. They have an impact on people’s lives – but the real change comes from the people themselves – to decide to make their lives better. If I am planning to go outside to play, and it starts to rain, the situation impacts me, but I am the one who decides if I’m going to stay inside complaining all day or if I’m going to find an alternative way to enjoy my day and be happy. Nothing stops positive attitudes. Make an intention to impact the world in a positive way. Four years ago, I received one of the most beautiful gifts. It was an invitation from my wife, Saundra, a yoga instructor and journalist, to join the gym. I didn't want to, but she persuaded me with love and the guarantee that we were going to enjoy it. I decided to go, and since that time, the gym has had a major impact on my health – not only through losing weight, but also because now we eat better and healthy food. I didn't understand how important it was until someone convinced me of it, but I had to make the decision to do it for myself. Besides the exercise at the gym, I can meet new people. Make an excuse to talk with the people and to listen to people. Learn a new hobby that involves other human beings. Do something to improve your life as a partner, boss, worker, professional, parent, son or daughter, spouse or friend. Re-invent yourself to be happy and accept yourself for what you are. Impact the world with your presence and with your acts. Be crazy and do something beautiful in your life now. You decide to do miracles as a magician. The only person who has the magic to have a better life is YOU.